The Bank of North Dakota is a nonprofit owned by the state. It is the only state-owned bank in the country. Rugby, North Dakota, identifies itself as being the "Geographic Center of the North American Continent"
The state of North Dakota is located within the Midwestern area of the country and is bordered by the Canadian provinces of Saskatchewan and Manitoba to its north, Minnesota to its east, South Dakota on its southern border, and Montana to its west. North Dakota is the 19th ranked most extensive state in the country with a land area of approximately 70,00 square miles. It is also the 4th ranked least densely populated state and the 3rd overall least populated state with a population of roughly 684,000 estimated as of 2011. The capital of North Dakota is the city of Bismarck, however the largest city in the state is the city of Fargo. The state is reported to h ave a very solid economy for the last decade with an average unemployment rate that is lower than the national average. It also has extensive employment opportunities, population growth, and relatively low housing vacancies. Most of the states recent growth can be attributed largely to the establishment of the Bakken oil shale fields located in the western region of the state, however it also experienced rapid expansion in the technology and service industries as well. 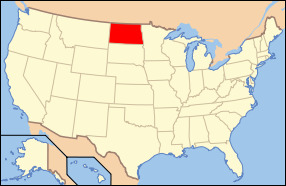 The geography of the state is largely considered to be Great Plains and is sometimes called the High Plains. The western region of North Dakota largely is made up of the hilly Great Plains as well as some of the Badlands. The highest point of elevation in the state is White Butte which sits roughly 3,506 feet above sea level and is located in the Badlands. The lowest point of elevation in the state is the Red River which is 750 feet above sea level. The states few major lakes are Lake Sakakawea and Lake Ohe, while the major rivers are the James River, Missouri River, and Red River. The state motto is “Liberty and union, now and forever, one and inseparable”. The state bird is the Western Meadowlark, the state fish is the Northern Pike, the state flower is the Wild Prairie Rose, and the state tree is the American Elm tree. 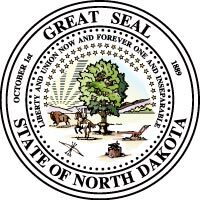 North Dakota is a very open, peaceful, and economically stable state that continue to remain a core part of the backbone of the United States.